This weekend brought a little bit of Louisiana to the Texas Farmers' Markets and we all passed a big time, cher! 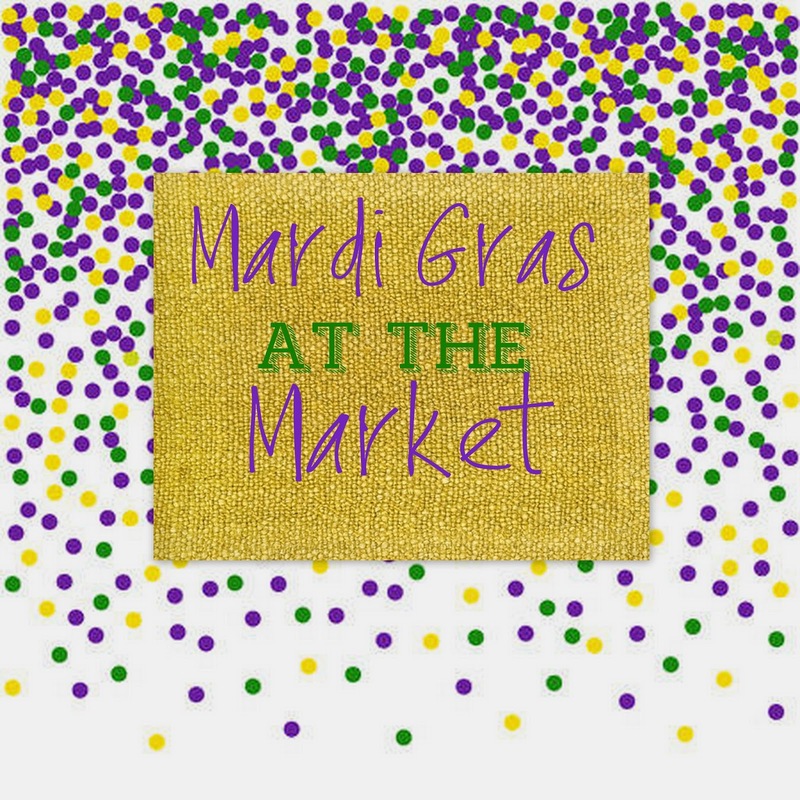 Mardi Gras was in full swing with sweet zydeco music, a second line parade, green, purple, and gold everything, and the occasional 'throw me sumthin', mister!' and ' laissez les bon temps rouler' ringing out from the crowd. 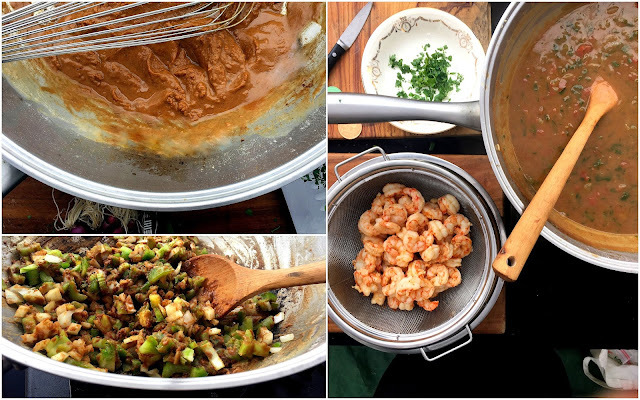 Under the chef demo tent, I stirred up a little excitement with the help of market vendors K & S Seafood, Stellar Gourmet Foods, and Johnson's Backyard Garden in the form of a simple but satisfying Shrimp Étouffée. So what is Étouffée? Why is it not Gumbo? What is the difference? Great questions. Étouffée, meaning smothered and most frequently made with shrimp or crawfish, but occasionally with chicken, is a butter or lard roux-based dish that includes the holy trinity-- onion, bell pepper, and celery, and sometimes tomatoes (Cajun dishes do not generally include tomatoes. Creole dishes do.) in a savory gravy. 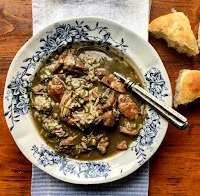 It differs from Gumbo primarily in that it features one protein instead of a combination, and never includes okra or file, like many gumbos do. It is a touch thicker than gumbo, and a bit richer, too. It is considered a more refined dish than gumbo, but that's probably more personal opinion and preference than culinary science. Below, find my basic Étouffée recipe. It is traditional and straightforward-- nothing fancy, but as with every Cajun/Creole dish it seems, there are many who would add ingredients, subtract ingredients, take shortcuts, skip steps, increase fat, decrease fat, or simply throw caution and good sense tradition to the wind and get crazy with it. Start here, and play around if you'd like. For this cook, experimentation has brought me around to a basic recipe that satisfies me and my dinner guests faithfully. In a large heavy skillet or Dutch oven, melt butter over medium heat. Increase heat to medium high and whisk in flour until incorporated fully with butter. Continue whisking constantly until roux is the color of peanut butter, about 10 minutes. Add onion, bell pepper, celery, and garlic, mixing into roux. Cook over medium heat, stirring frequently, until vegetables are wilted and onion is transparent, about 5 minutes. Add tomatoes and stir to combine well. Slowly whisk or stir in the stock gradually over medium high heat until sauce is smooth, bubbling, and thickening. Stir in seasoning. Bring to a low boil, stirring, then reduce heat to medium and continue to cook, stirring occasionally, about 15 minutes. Fold shrimp, parsley, and green onion into gravy, cooking shrimp through until opaque-- about 3 minutes. Correct seasonings, adding more creole seasoning, salt, and/or black pepper as needed. Serve over cooked rice, with hot pepper sauce on the side. At the Texas Farmers Market, I used shrimp from market vendor K & S Seafood, Creole Seasoning Blend from Stellar Gourmet Foods, and organic parsley and organic spring onions from Johnson’s Backyard Garden. In lieu of shrimp stock, substitute seafood stock, chicken stock, clam juice, water or any combination thereof. If you aren’t squeamish about handling shrimp shells and heads, purchase shrimp with shells and heads on, then remove them yourself and make a stock by covering with water, adding a few peppercorns and just a pinch or 2 of salt along with half of a whole onion and some celery scraps and simmer over medium low heat for 30 minutes to an hour, adding water as needed to keep ingredients covered. I love Stellar Gourmet Food’s Creole Seasoning Blend because salt is not its main ingredient. I like to control the amount of salt added, without under or over seasoning the gravy. I have also used a homemade seasoning blend. If neither is an option, try to obtain a low-salt version of your favorite creole seasoning. Disclosure: This recipe was prepared for the Texas Farmers' Markets, where I contract as Market Chef. Ingredients from market vendors were provided free of charge for promotion and demonstration. Overwhelmed with the seasonal options at the farmers market? 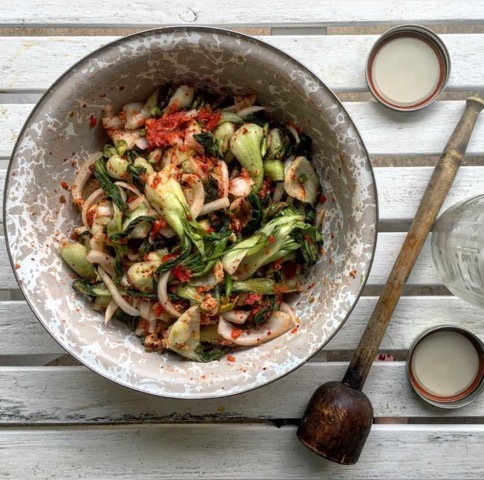 Stymied by how to make the most of your CSA share? Want to incorporate more vegetables as part as your healthy lifestyle but just don't know where to begin? WE HEAR YOU! Join market chef Maggie Perkins, in partnership with Johnson's Backyard Garden, as she prepares a vegetable-centric meal from seasonal vegetables all found in this month's Central Texas farms and fields, then take home your recipes, your new-found skills, and YOUR COMPLETE JOHNSON'S BACKYARD GARDEN CSA SHARE. 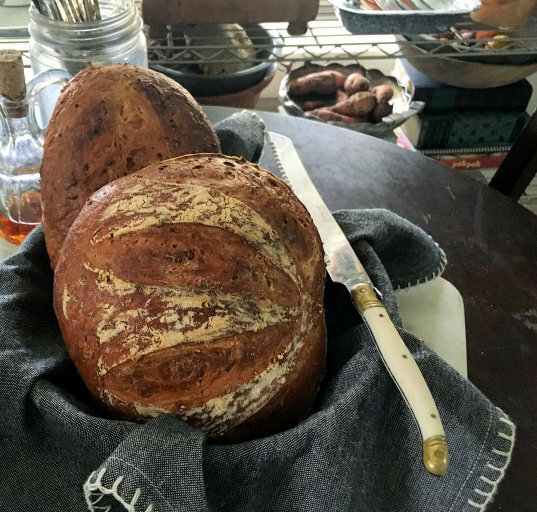 Maggie will share the best tips, tricks, and techniques for making the most of your market basket bounty, including how to set up your pantry for easy, tasty meals with minimal prep and maximum flavor. February's seasonal vegetables may include beets, brussels sprouts and greens, cabbage, carrots, dandelion greens, kale, spinach, parsley, lettuces, scallions, sweet potatoes, radishes, and turnips. Dishes served include vegetarian, vegan, and meat-eating options. 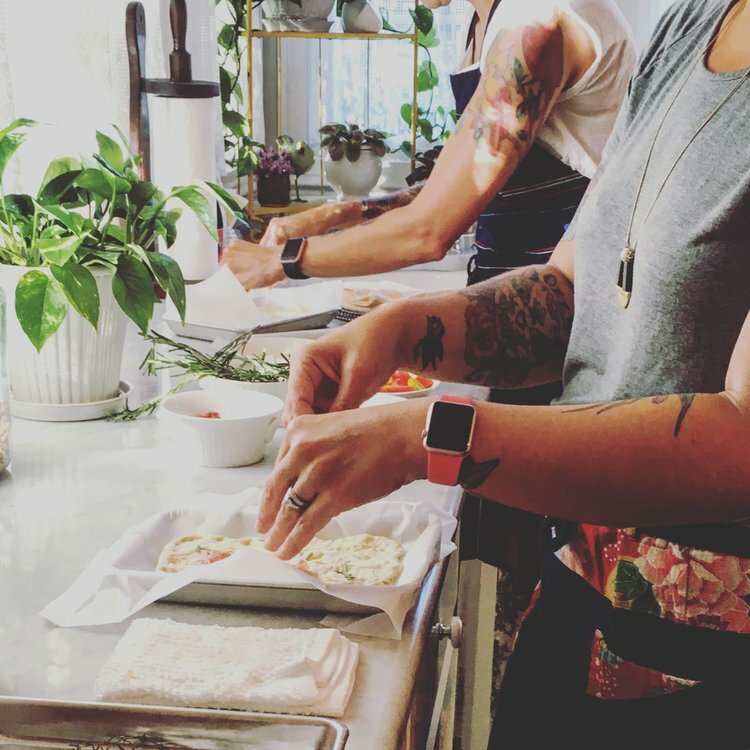 Soups, stews, stir-fries, sauces, appetizers, salads, entrees, and more, join this intimate class to elevate your vegetables from plain Jane to POW! Reserve your ticket below. REGISTRATION ENDS SUNDAY, FEBRUARY 26. Like a tarter, healthier version of American cream cheese, Labneh is a Middle Eastern dairy specialty made from draining the whey from yogurt. Grab a few things and let me show you just how easy it is to make your own. You'll need all of the items shown above to make your first batch of plain Labneh. The salt is recommended, but optional. I prefer whole milk yogurt, but have had succesful results with both low and no-fat yogurts, too. Let your conscience be your guide. I subscribe to the assertion that saturated fats from whole milk dairy products can have a place in healthy diets as long as consumed in moderation. I use a fresh jar of organic probiotic whole milk yogurt. Get the best your budget allows. If using salt, stir about 1/2 teaspoon into a quart jar of yogurt. Prop strainer over whey-collection vessel. Line the strainer with 2-3 layers of cheesecloth. Transfer the jar contents to the strainer. Shake it around just a bit to get any air out. Tie the four corners of cheesecloth together. Hang over a faucet, or a cabinet pull, positioning over the collection vessel to drain. Allow to drain 12 hours (for creamier, more dense cheese, allow to continue to drain for up to 24 hours). Remove and place back in the strainer, untie, and gently remove the cheesecloth from around the cheese. Transfer to a serving bowl, or a storage container with a lid. The sky is the limit with the many uses you'll find for Labneh. Tangy, rich, and satisfying, a little goes a long way in satisfying my cheeeeeese jones with a little less indulgence. It pair well with many Middle Eastern dishes, but don't stop there. Recently, I stirred in a spoonful of my best citrus marmalade and spread it on toasted raisin bread--for dessert! I love to add minced garlic or shallot, fresh and dried herbs (mint is a favorite), the zest of oranges and lemons, and my favorite-- black pepper. I'd love to hear the ways you find to use Labneh. Have you tasted it before? Made it before? How did it go? I'm terribly curious to find out how you use one of my favorite condiments. Last week I made a Persian Eggplant Salad that I ate along with this batch-- I'll be sharing that dish this week, too. And for even more ideas, check out this slideshow from Bon Appetit. Do you have favorite Middle Eastern foods? Places to eat it? Do tell! 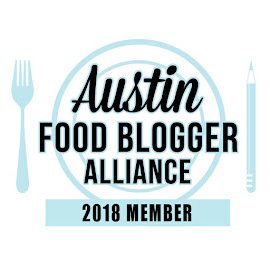 And if you're in the Austin area, check out Saffron & Sesame | Middle Eastern Food in Austin, my #ATXBESTEATS City Guide for the best in town. 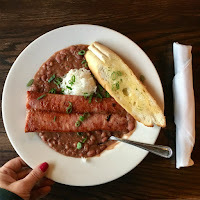 A little magic, a little science, a little art, Creole Red Beans & Rice with Andouille Sausage is a southern cook’s expression of affection; a one pot love affair for friends and family alike. 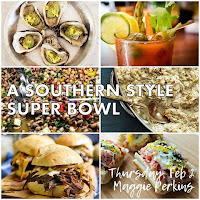 Join market chef and food writer Maggie Perkins of Notes from Maggie’s Farm, as she breaks down the basic bones of this iconic dish, beginning with the proper bean, the proper prep, the proper rice, and the proper sausage-- at least according to southern Louisiana cooks, that is. Historically, a savory pot of Red Beans & Rice was prepared on Mondays-- wash day in southern homes. The pot could go relatively untended while clothes were washed and hung on the line. These days, you’ll find it on family tables as well as the finest white-tableclothed restaurants, every day of the week. But there’s a little more skill involved than first meets the eye. 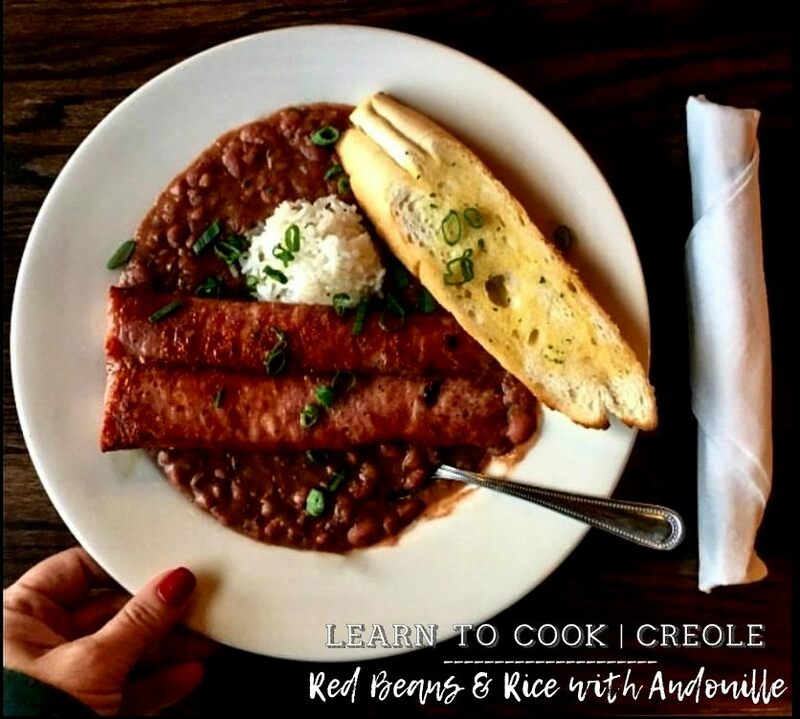 You’ll be as entertained as you are enlightened by hints, tips, family secrets, and raucous stories about life in Bayou Country while learning to prepare this iconic dish, and feasting on Red Beans & Rice with Andouille, garlic bread, and traditional Sensation Salad. 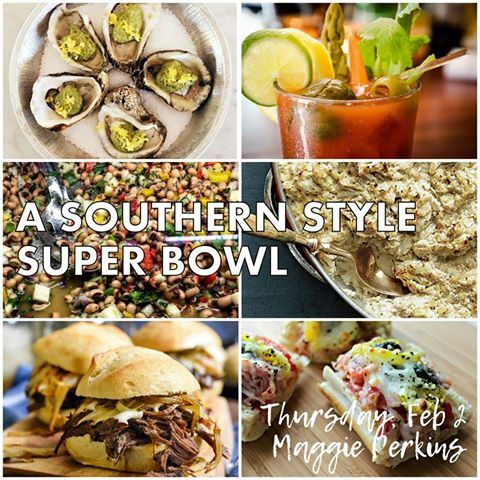 Just in time for the Mardi Gras season, you’ll be throwing around lagniappes and who-dats by Fat Tuesday. Come join us, cher, it’s going to be a BIG TIME. C’est si bon! No refunds, however transfers are allowed. Yesterday, I had the pleasure of attending a private tasting of Tullamore D.E.W. 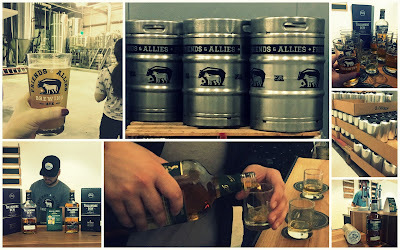 Irish Whiskey at the new Friends & Allies Brewery in East Austin. Drinking a Tullamore D.E.W. with a beer unlocks the complimentary flavours in both, and the classic ritual of enjoying both beverages side-by-side goes back generations. It’s an old Irish tradition that we hope to celebrate and share with the world. The perfect pairing of D.E.W. and a brew may go way back, but the tradition is timeless. 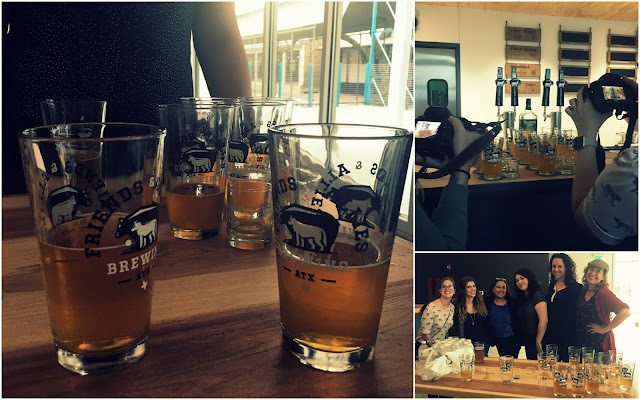 The event was held at the newly opened Friends & Allies Brewing Brewery and Beer Garden on Springdale, in East Austin. Very hip digs. Easy to find, ample parking, bright and modern space. I'm looking forward to spending more time there. Great beer, too! Jane treated us to an informative brewery tour and we had the opportunity to sample pours of Friends & Allies' Noisy Cricket, Session IPA, Urban Chicken, Saison, and Springdale, White Ale (and my favorite). I look forward to returning to try their Fresh Coast IPA, available soon. Follow the links to find more information on each style, including ABV%, and hops and malt profiles. After the tour, we got down to the business of tasting. 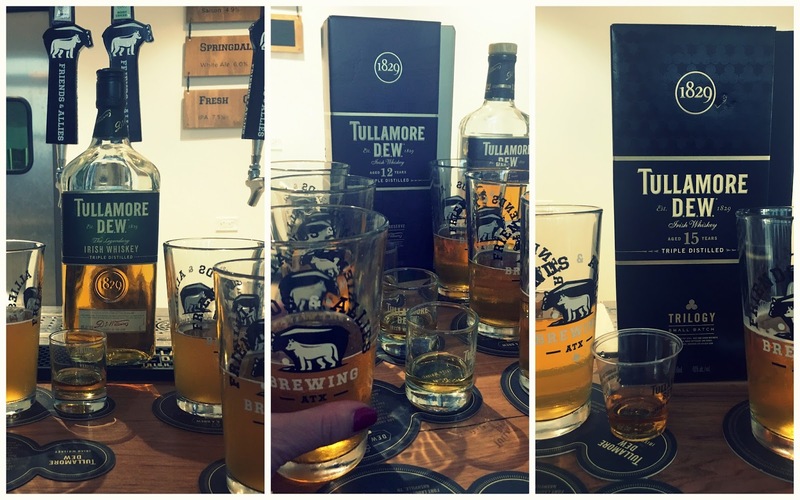 Traditionally called a Boilermaker in America (learn more about that, here), we tasted three pairings-- F&A White Ale with Tullamore D.E.W. Original, Urban Chicken with 12 Year Old Special Reserve, and Noisy Cricket with 15 Year Old Trilogy. My favorite beer, alone, was the Springdale White Ale, my favorite whisky was the 15 Year Old Trilogy, and my favorite pairing, the Urban Chicken with the 12 Year Old Special Reserve. I found the pairing really showcased the fruit and spice flavors of the F&A Saison. 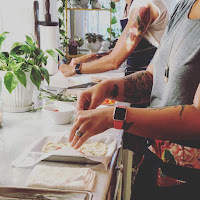 We came, we saw, we tasted, we Insta'd and tweeted, and checked in and all of those things we bloggers and writers and eaters and drinkers do. I learned a lot about the Boilermaker, Irish Whisky, and tasty brews, and enjoyed making new friends and enjoying established friends, too. The Tullamore D.E.W. and A Brew Tour is headed, next. to New Orleans! What a fine time to find yourself in the Big Easy. Look for them in cities North and East, and be sure to give them a warm welcome. Thank you for a real good time, Tullamore D.E.W., and safe travels! Disclosure: I was invited to attend this tasting free of charge. All liquor was served gratis. All opinions (and photos) are my own. 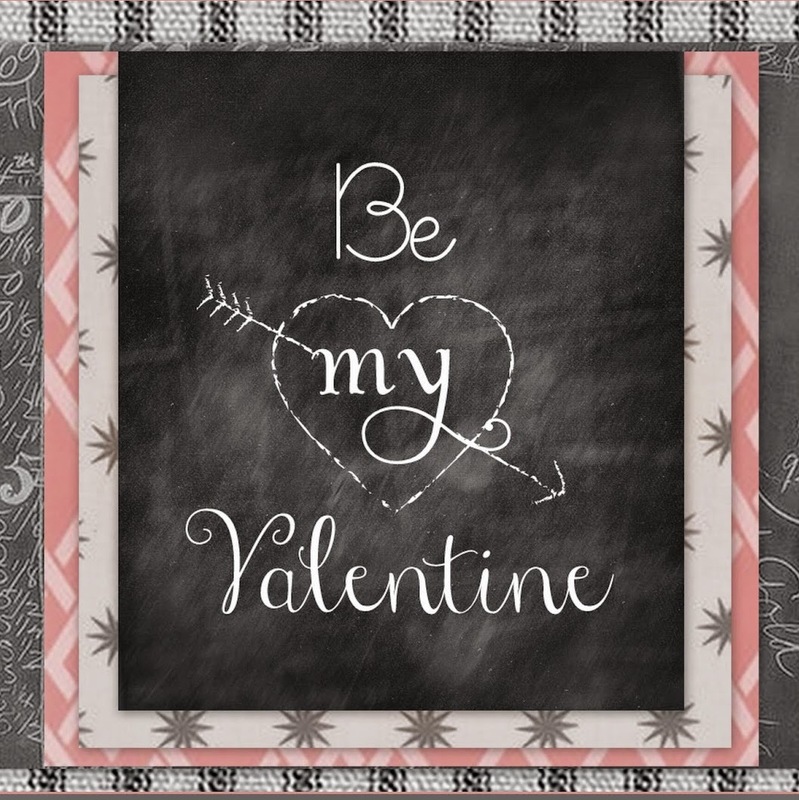 Though the big retail business that is Valentine's Day might suggest otherwise, I've always thought the very sweetest things you could share with the sweetest people in your life are handmade and from the heart. 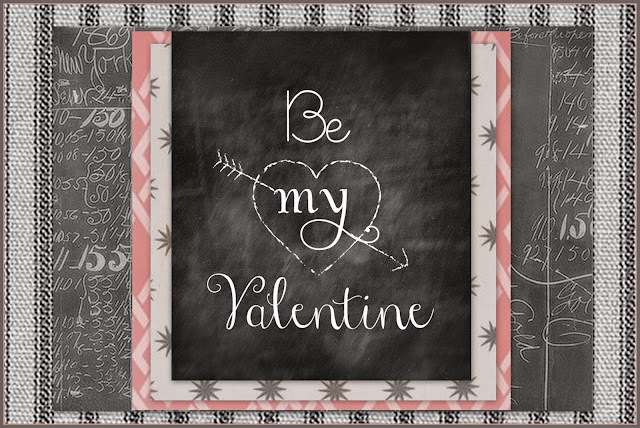 A gander through scrapbooks and hope chests will bear me out-- that second grade valentine that misspelled your Mom's first name is tucked among the most cherished memories where no flashy gifts are stashed. Chuck the fancy boxes of chocolates and treat your loves to your personal handiwork in less time, with less cash, and make what truly matters. A precious memory. Sift flour, cocoa, baking powder, baking soda and salt into mixing bowl. Whisk in buttermilk, maple syrup, coconut oil and extracts until combined. Let batter sit, covered, for 30 minutes. Spray large nonstick skillet with silicone cooking spray, and heat over medium heat. If using, coat interior of silicone heart-shaped molds with silicone cooking spray. Place molds into preheated skillet. Pour 1/8 cup batter into mold for each pancake. (Alternatively, pour batter into round pancakes about 4” in diameter.) Cook until bubbles form on the surface and edges begin to set. Remove mold and gently flip with a spatula, cooking about 1 minute on opposite side. Remove to paper toweling, and sprinkle with powdered sugar. Disclosure: This recipe was prepared as a chef demo for Texas Farmers' Markets at Lakeline and Mueller, for which I serve as market chef. Stellar Gourmet Mulled Maple Syrup was provided free of charge to sample at the market. 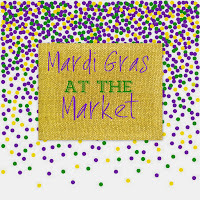 If you find yourself in the Austin area on February 25 and 26, come catch an authentic taste of Mardi Gras-- Shrimp Etouffe featuring K&S Seafood. We're going to pass a good time, cher! I am excited to have added a new feature to Notes from Maggie's Farm this year-- an entire page devoted to Classes and Events. 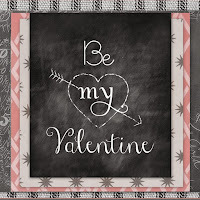 Below, find out what I'm up to in the month of February, then check back by clicking on the link in the navigation bar, above. You'll find featured monthly events and my calendar, updated as classes and demos are added. Thank you for keeping up with all that's going on with Notes from Maggie's Farm. Learn to Cook | Pho! Sometimes food is so much more than food. Food is Love. 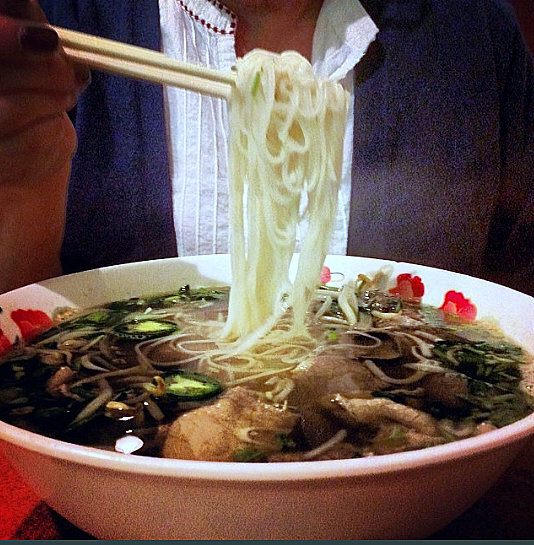 There are dishes that elicit precious memories from the senses. Pot roast cooking reminds me of my mother and how, as a child, the house smelled delicious when we returned from church and made that seemingly endless hour of absolute quiet and stillness in the pews under threat of my pretty mother's scary eyebrow almost worth it. It was my job to slice the scallions for the potatoes and set the table. I think it was my brother's job to put ice in the glasses. We waited impatiently for the rolls to brown and the gravy to thicken, and to the faint background sound of referees' whistles from the console television in the next room, we'd finally sit down to Sunday dinner. Savory meatloaf reminds me of my Granny Mac, and the way she cut it into perfect cubes for my brother and me, served alongside simple mashed potatoes and canned sweet peas. Always such an orderly plate, and I can close my eyes and almost feel the dish towel tucked into my collar. We were a tidy lot. We took naps at Granny's, settling down midday to the opening theme of Days of Our Lives and waking with the imprint of her cotton bedspread on our little sweaty red cheeks. A pot of smoky, salty fresh green beans on the stove takes me back to dinners with my Granny Ruth. Sweet memories of eating together around her little dinette set, in her small, slightly creaky, kitchen, much like mine, today. She added real sugar to each glass of tea, tending to each plate slightly stooped with a soft cotton apron, stockings rolled down around her ankles, sensible shoes, and a twinkle in her eye. The day long process of putting by bread and butter pickles reminds me of my great grandmother Josie-- and while it is her chicken and dumplings I craved, and still do, I suppose my young brain tucked away the fragrance of sweetened vinegar and spices from visits to her Arkansas kitchen. Josie had a way of making you feel like you were more special than anyone else. It seems like just yesterday that she'd give me a warm tight hug and I'd feel her soft, crepey powdered cheek against mine. The heavenly scent of greens cooking down on the stovetop takes me back to summer dinners at my Gana's. My grandfather kept a garden, and during the Oklahoma summers, he would have a bountiful harvest. I loved those times when all of the cousins came, and my uncles and aunts and my Dad would laugh and argue and tease each other and we kids would play hide and seek. If we were lucky, Gana would fry chicken, and all was right with the world. I also remember with fondness the Sundays when my father picked us up and spent the day with us-- we had only a faint idea of the meaning of custody but we knew we loved every minute of Sunday. And my Gana would fix a big lunch of Papaw's freshly-picked vegetables-- maybe okra, maybe squash, maybe peas, depending upon the season, but there was always sweet iced tea, sliced cucumbers in cider vinegar and a stack of sliced bread on a brown melamine plate for us, and quite often, a bowl of smothered greens for the adults. I suppose our palates were not quite developed, but nevertheless, the fragrance now transports me to a sweet childhood long ago. Luckily for me, I get to visit those memories often by way of the produce available at the farmers market. Last weekend, I prepared several types of greens several ways. Yesterday's post included vegan, vegetarian, and virtually meat-free options prepared at TFM Lakeline. The following day at TFM Mueller, I offered those as well as a more traditional preparation highlighting Belle Vie Farm & Kitchen Smoked Ham. I trimmed the unctuous, velvety fat from the ham, and rendered it in a hot cast iron skillet over medium high heat to liquefy, then reduced the heat and added one large sweet yellow onion, sliced, and browned them slowly, stirring frequently, to yield a golden, slightly sweet caramelized pile. I scooted them off to the side and added the smoked ham, cut in small cubes, and allowed them to slightly brown on the edges, stirring around occasionally. I then added two healthy bunches of JBG Organic Rainbow Swiss Chard, sliced thinly, piled high. I added salt and freshly ground pepper, and let them cook down until they were wilted. I added a sprinkling of apple cider vinegar-- perhaps a teaspoon or two, and stirred it down into the crusty bits in the bottom of the pan, scraping a bit until they were loose and stirred into the greens. I corrected the seasonings, and served them to a hungry and appreciative crowd. At home, this would yield 2-4 healthy servings, and I think it would not be embellishing it too much to say they'd be absolutely heaven with a wedge of southern-style cornbread. And maybe a glass of sweet iced tea. Green, green GREEN. The markets are flush with GREEN. Or GREENS rather. 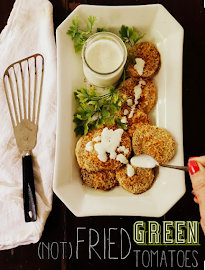 Tis the season for healthy, nutrient dense greens, and below, you'll find three quick ways to prepare them that will please even the most stalwart of greens-averse eaters. I should know. I once was one, myself. Never one to do things small, some 8 plus years ago, I decided that I was a farmer. Overnight. You'll find the rest of that story, here. And if that wasn't BIG enough, I decided that I'd eat, primarily, only food that I grew or raised myself. That first year. That first year before the garden was even tilled. That first year that began at the end of....November. You know what grows in Texas in the winter? GREENS. Lots of 'em. And this city girl turned farmer (turned city girl, again, since) didn't really cotton to greens. But I'd made a pledge, darn it, and I wasn't going back on my word. Even if it was a word that seemed impossible to adhere to in the light of day when one with more sense and less stubbornness would have acquiesced, read the writing in the dirt, and hit the closest grocery store. Nope. Not this girl. Not this FARMER. I had no sense. And that's how it came to be that this FARMER, learned to cook GREENS. Lots of 'em. And I learned to like them. Heck. I learned to LOVE them. A few simple ingredients, that I did not grow that first season incidentally ( I said primarily. PRIMARILY. ), and I discovered how to turn out a bowlful of greens that both nourished and delighted, and dang it if I didn't start craving greens. 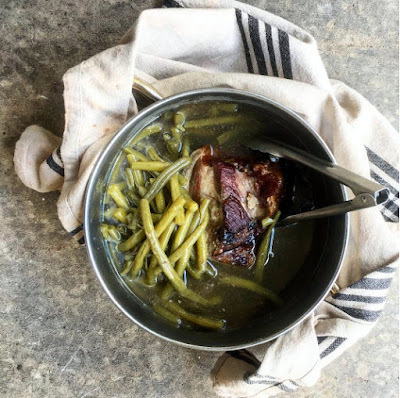 Now traditionally, a pot of greens in many southern homes would require a lot of smoked pork, a lot of time, and not just a little bit of bacon grease. I set about to create, through trial and error, and reduced each of these elements to retain the nutrients and cut the fat, so to speak. A lot has changed since that beginning crop. A WHOLE lot. But a few things remain. I still love my greens, and I still know how to make them shine. I like them garlicky, peppery, savory, a tad salty, a touch smoky, and quick. I shared my secrets last weekend at the Texas Farmers' Markets with the help of a bounty of greens from Johnson's Backyard Garden, as well as some of my favorite market products-- turkey bone broth from Belle Vie Farm & Kitchen, and pretty and plump Crimini mushrooms from Kitchen Pride. If you happen to be outside of the Austin area, I bet it wouldn't be hard for you to find some worthy substitutes. Save for the turkey broth, no meat was added to the recipes, below, but a heartier meal might include a fried egg or two, a crumble of feta or goat cheese, and perhaps a few ounces of the meat or seafood of your choice. You'll see below that I brought a few faithful food friends along-- garlic, onions, chili flakes, smoked salt, ginger, rice wine vinegar (unseasoned) and toasted sesame oil-- a great start to building a pantry of staples that will keep you creating healthful, and less indulgent greens that the whole family, and most importantly, YOU, will love. Add all ingredients to a large saucepan over medium high heat. Bring to a boil, then reduce to a rolling simmer, covered, and cook until greens are as tender as you like them, or about 30 minutes. Season with optional smoked salt. Adjust seasonings. Over medium low heat, bring olive oil to a shimmer, and add sliced onions. Cook slowly, stirring often, until onions are golden brown (about 40 minutes). Remove from skillet, retaining any remaining liquid. Add mushrooms to skillet, along with enough oil to keep them from sticking, if necessary. Increase burner to medium high heat to sear mushrooms. Add greens to skillet and return caramelized onions. Cook, stirring frequently, until greens have wilted, about 15 minutes. Season with black pepper. Optional: 1 bunch young carrots, sliced crosswise, lengthwise, or both, simmered in salted water until crisp-tender. Warm grapeseed and toasted sesame oil in skillet over medium heat until shimmering. Add garlic, stirring constantly, until golden. Add remaining ingredients and cook until chard is limp. Add rice wine vinegar, stirring and scraping the juices from the bottom of the pan and incorporating into greens mixture. Add carrots to greens, optionally. Correct seasonings and serve. Disclosure: I am a contract market chef for the Texas Farmers' Markets. Except where indicated, the food above was provided free of charge by vendors for demonstration. 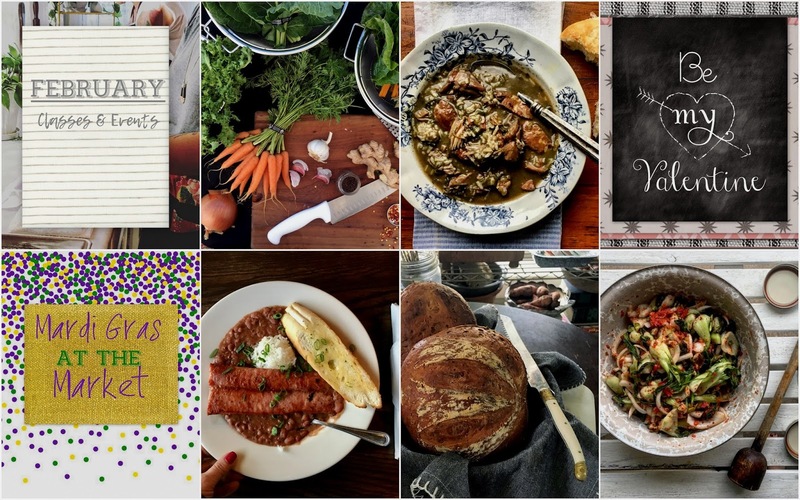 Recipes and photos are my own.